Young environmental activists create big changes one school at a time! 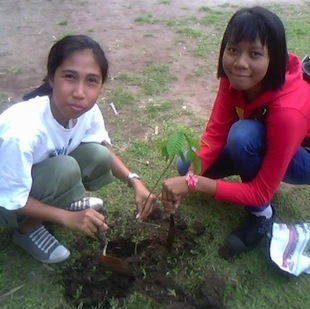 Youth from Indonesia and U.S. learned how to organize their fellow students, inform and educate their families and communities and initiate change for a “greener” future as part of Legacy’s Indonesia-U.S. Youth Leadership Program. See U.S. participants Environmental projects also. Watch Michelle’s Project U&I documentary video. Cristo’s group introduced a trash management program with separation bins plus workshops on how to make saleable products from recycled materials. Cristo and his friends not only excelled in being creative, they were also great in winning people’s heart to get donations. 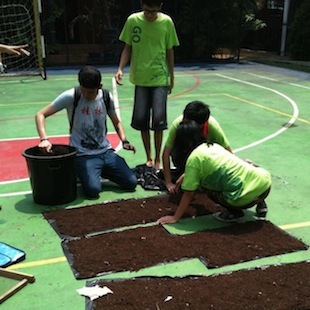 They also raised funds by selling their recycled products especially compost, helping their project to be sustainable. Izzet and Vivi’s encouraged all the school members, including the principal, teachers and students, to ride their bikes to school to reduce Air Pollution. 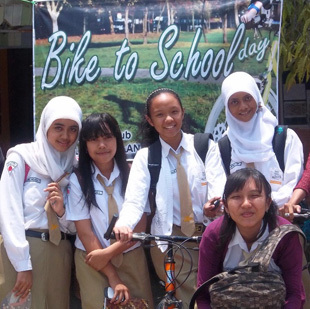 The school officials loved their project, and instituted every Friday as “Bike to School” Day. Now, no student or school official is allowed to ride a motorcycle or drive a car to get to school on Friday. They must walk, bicycle, or use public transportation. They have effectively created change in their community. Dea and Mai’s goals were to help prevent sand beach erosion, and restore the coastal ecosystem. They introduced the benefits of preserving mangroves to create a sustainable relationship with mutual benefits between humans and nature, to school officials, their community, and fellow students. They arranged for a donation of 212 mangrove seedlings from the Regional Forestry Department of Bangkal and recruited 80 volunteers for the planting event. Rahmat and Upi’s introduced a trash management program to create a cleaner environment at each of their respective schools. They gave an environment presentation and training to students at the schools concerning the trash problem, and how to solve it. With eco-friendly trash bin sets and a recycle activity every Monday and Wednesday after school, they are teaching their fellow students how to make saleable products. Now, there are eco-friendly trash bins in both schools. Both schools look cleaner and nicer, and the students are very proud to be a part of the changes. The Indonesia-US Youth Leadership Program (I-US-YLP) offers high school students a practical, hands-on experience in environmental action planning and leadership development. This two-way exchange focuses on community activism to address local and regional environmental issues in the U.S. and Indonesia. I-US-YLP highlights young people as our future leaders and as valuable contributors to their communities. The I-US-YLP initiative is sponsored by the U.S. Department of State’s Bureau of Educational & Cultural Affairs and implemented in partnership with the Center for Civic Education Indonesia (CCEI).